Lentils are pressure cooked in a flavorful sauce of garlic, onions, tomato, and brown sugar. 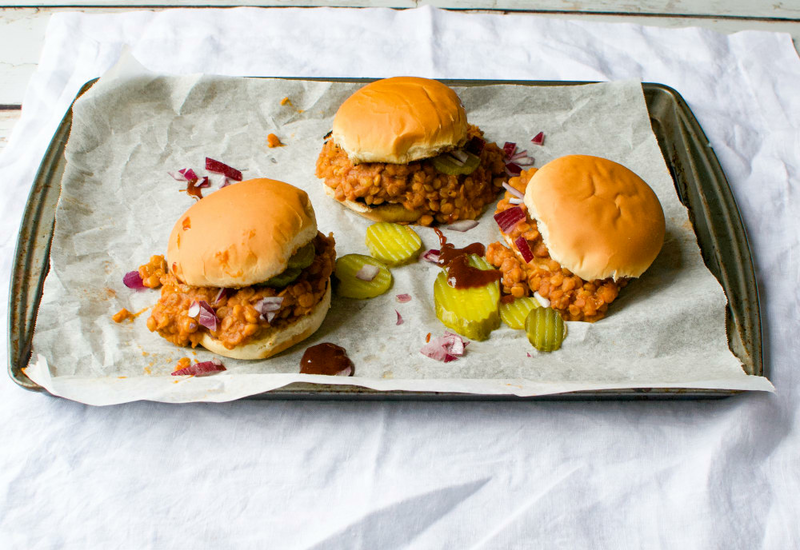 It is seasoned with mustard powder, paprika, and chili powder to impart authentic flavor into these vegan sloppy joes. When prepared in your MultiPot pressure cooker, they are done in just about a half an hour. Optional topping ideas: pickles, onions, hot sauce, and barbeque sauce. Most traditional Worcestershire sauce brands contain anchovies. Read labels carefully or ask your grocer for a vegan-friendly alternative to use in this recipe. Per Serving: 207 calories; 2g fat; 39.0g carbohydrates; 9g protein; 0mg cholesterol; 662mg sodium. I really enjoyed making and eating these lentil sloppy-Joe style sandwiches. The filling mixture was really delicious, and the flavor resembled authentic sloppy Joe very much. I added pickles and sliced onions to mine, and it was really good. I'm not vegan but I love these lentil sloppy Joes! I used red lentils instead of green, but other than that I kept the recipe the same. They turned out really good, perfect texture and flavor. Lentils are so incredibly versatile, they are the perfect meat substitution for these sandwiches. Really loved this sloppy joe recipe. Not sure where I could find vegan Worcester sauce so I used regular (yes, with anchovies). I loved it more than my kids, but they’re picky anyway. I served it on Hawaiian buns. Big hit in my household. My husband is not a fan of vegan dishes but the lentils gave this one a true meaty texture. I swapped out the brown sugar for turbinado sugar and used potato buns.